In hearings on the Hill, in the halls outside of congressional offices and in a slew of press conferences, supporters, and opponents of embattled Supreme Court Justice nominee Brett Kavanaugh have sought to influence the direction of what participants have come to view as a pivotal political moment in the #MeToo movement. Women who say they support Kavanaugh, who Christine Blasey Ford alleges sexually assaulted her roughly 30 years ago when they were both high school students attending separate private schools in suburban Maryland, have written letters to vouch for his character and were slated to hold a press conference on Friday. Their event comes a day after a similar show of support from Ford's classmates and senators. And on Thursday, a wave of protesters descended on Capitol Hill — and into senators' offices — to oppose Trump's Supreme Court nominee. The protesters took to the halls of the Dirksen and Hart Senate office buildings, confronted key members of the Senate committee charged with hearing testimony from both the accused and the accuser, and share personal stories of sexual assault. The gathering chanted "We believe Anita Hill" and "We believed Dr. Blasey" with fists in the air, as they defied warnings from Capitol Police to disburse. Protesters are arrested during a demonstration in opposition to President Donald Trump's Supreme Court nominee Brett Kavanaugh on Capitol Hill in Washington, Sept. 20, 2018. Dozens of protesters, many of them women, converged at Senate Judiciary Committee Chairman Chuck Grassley's office to pressure him to vote "no" on Kavanaugh's nomination, before being arrested. "He has one of the most important decisions facing our country before him right now," one protester urged while occupying the Iowa Republican's office. "Sen. Grassley's position is that they're going to be hoping to have a hearing on Monday regarding the allegations against Judge Kavanaugh by Dr. Ford," one staffer responded to the crowd of demonstrators. "What about an investigation," another protester demanded, despite the senator not being there. "Sen. Grassley's position remains that the — it is the committee's job to determine qualifications of nominations," the staffer replied. Wearing buttons that read, "I believe Dr. Christine Blasey Ford," the demonstrators would not let up, even as police officers detained them. 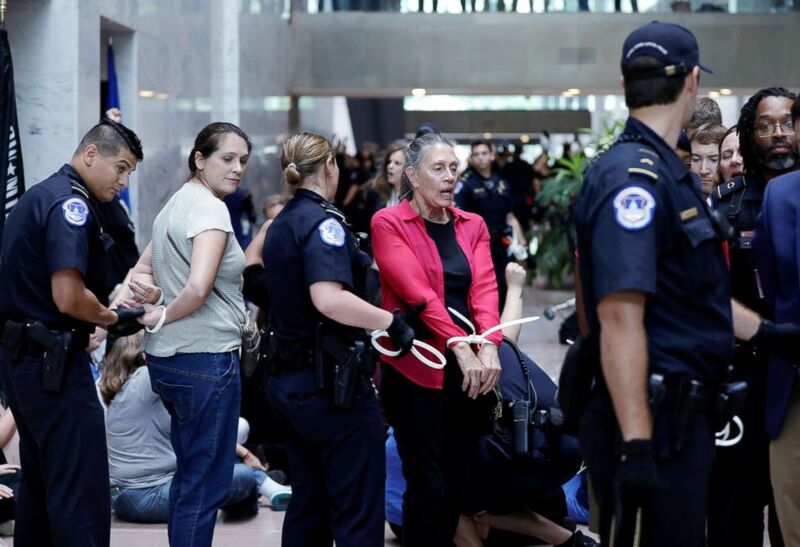 By the end of the day, Capitol Hill Police arrested 56 people for "unlawful demonstration activities," according to Capitol Hill spokesperson Eva Malecki. "We believe that he should be here listening to people's voices from all across the country about why he should vote no on Brett Kavanaugh," the protester added. Among the earlier protesters, 23 were removed from the fourth floor of Dirksen. Another 33 were removed from the first floor of the Hart, after protesting outside Republican Sen. Bob Corker of Tennessee. "Sometimes it takes a woman a long time to talk about something like that," a protester, referring to sexual assault, said directly to one of Corker's staffers. "It doesn't mean she's lying when she does. And I think Sen. Corker should listen for real."